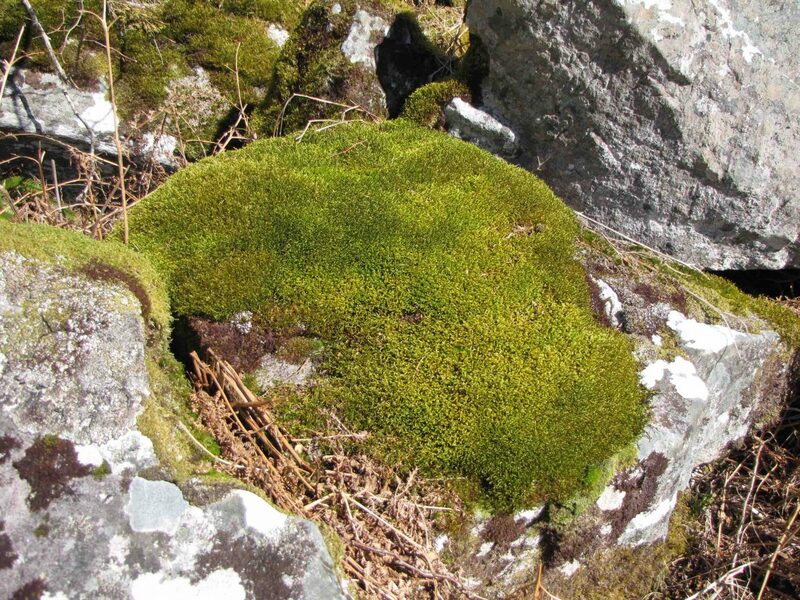 On 29thMarch 2018, Gordon Rothero and Ian Evans made a spring visit to Torr Mor to record bryophytes. Gordon logged some 51 mosses and 16 liverworts in the woodland, many on the damper north-facing side, which has more favourable habitats for this group. 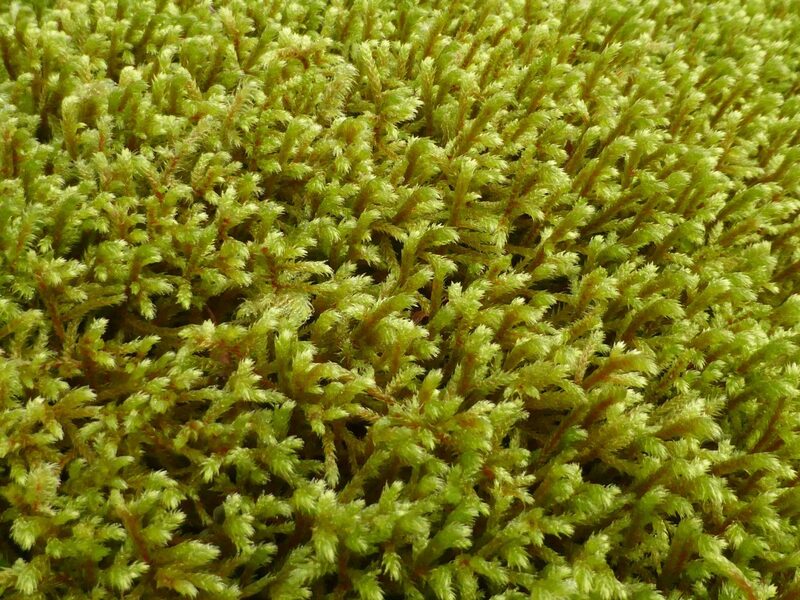 However, boulders in one of the hazel groves on the sunny, south-facing flanks of the wood were covered with splendid thick mats of the pendulous wing-moss Antitrichia curtipendula (photos 1 and 2). Woodcock were flushed twice from the woodland and a tawny owl pellet yielded the remains of at least three field voles. 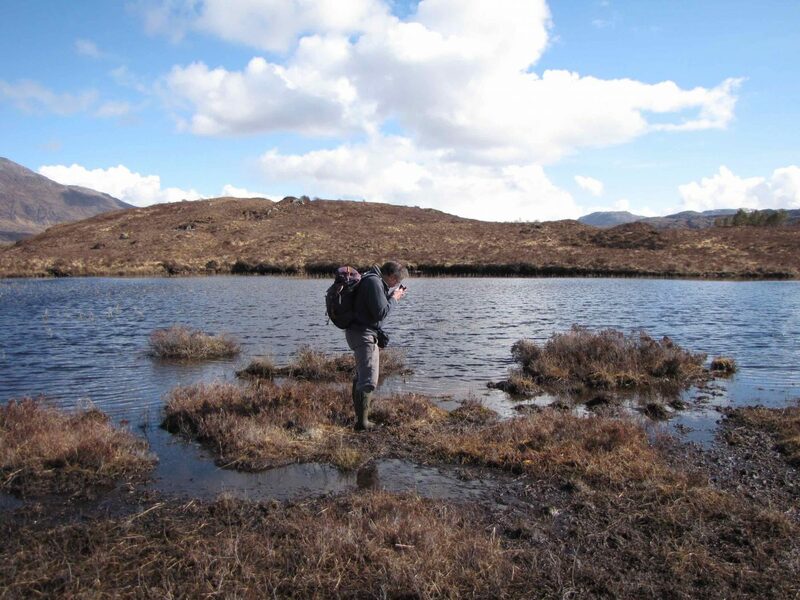 They then made their way north across the boggy Lon na Smeoraich, where Gordon added a fourth record for Assynt of the bog-moss Sphagnum subsecundum. After lunch they continued round the wooded western end of Loch na h-Innse Fraoich to the un-named lochan north of the highest part of the Loop Path, at NC157262 (photo 3). Spawning frogs were calling from the well-vegetated shallows at the southern end of the lochan and several mallard rose from the northern end. The lochan margins and adjacent areas added a further 13 mosses and 8 liverworts to the list for the day, giving a total of 94 species of bryophytes. 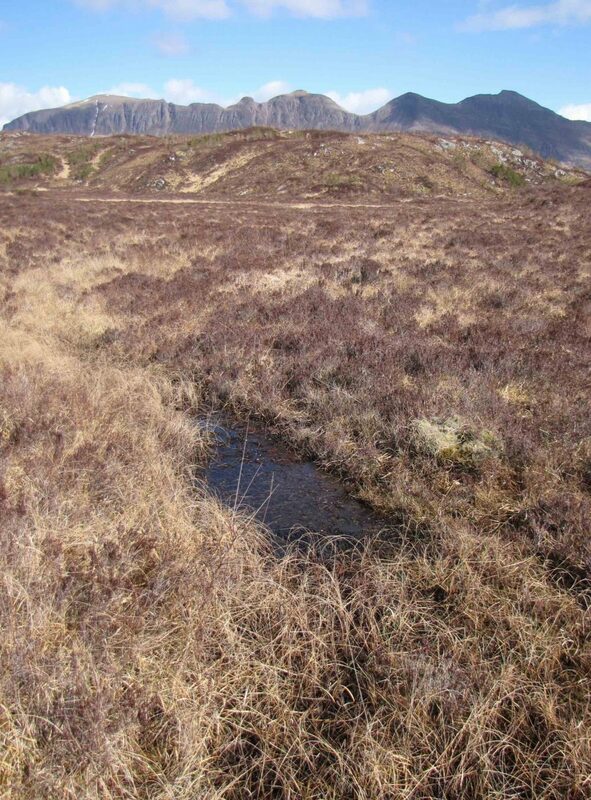 It was, however, an initially unimpressive boggy ditch (photo 4) near the outflow burn of the lochan, at NC159262, that provided the most surprising find of the day. It harboured a dense growth of one of the large green algae known as stoneworts, Chara virgata, a handful of which was brought back for identification. This was later squeezed and filtered to collect any desmids present. The sample seemed a bit thin, but was sent off anyway to David Williamson in Leicestershire, one of few British experts in this group of microscopic green algae. A fortnight later an excited telephone call from David revealed that the sample had contained the first specimen recorded for the British Isles of the desmid Cosmarium tuddalense, originally described from Norway. A further sample will be collected in due course and the vegetation of the ditch surveyed in detail so that the find can be published. Stoneworts prefer waterbodies with a high pH, i.e. on the alkaline side of neutrality, but Chara virgata can tolerate waters down to pH6 and is not uncommon in peaty pools on the Lewisian gneiss, which can also be very rich in desmids.